1. Lacking Confidence: A horse that is lacking confidence and is feeling a little bit nervous can become pushy. This can be because the horse wants to be close to you for comfort, the horse is nervous and distracted and as a result isn’t paying attention to your personal space, or the horse is testing to see how good a leader you are and if it is safe to follow you. 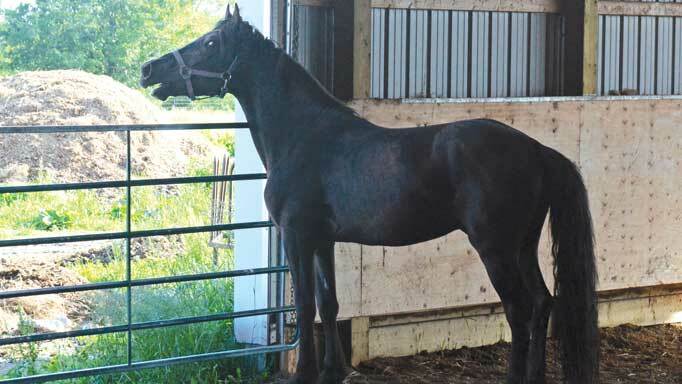 Recognize this behaviour when the horse will try to place you at their wither area and/or display other signs of being nervous such as neighing, having a tense posture, ears pricked and distracted, etc. 2. Dominance Play: A horse that is being dominant will be pushy. Dominance is the behaviour of a horse in relation to his rank in the herd. When a horse is being handled by one human, then the herd becomes a herd of two (the horse and the handler). In every herd there is a distinct rank to determine who is leader, as the leader is in charge of keeping everyone safe in the herd. We know who the leader is based on who can move who, and who can touch who. If the horse can make you move your feet by pushing into you, then the horse will perceive himself to be the leader (or he will think you are a really bad leader!) Recognize this behaviour especially when the horse seems to be more aggressive in moving you, such as pinning his ears and threatening to nip or kick. 3. You Taught the Pushy Behaviour: Horses don’t know what is right and what is wrong … they only know where the comfort is, and where there is discomfort. This is learned behaviour based on what boundaries we have taught them as their handlers. This means that if the nosey horse snooping for treats is actually given the treat, then you are encouraging your horse to snoop for treats. If your horse rubs up against you and then you scratch him back, then you have taught your horse it is okay to rub on you. Recognize this behaviour when the horse comes in for a scratch, but rubs you so hard you stumble, or the horse just generally seems to have a lack of respect for you, even if he isn’t aggressive. 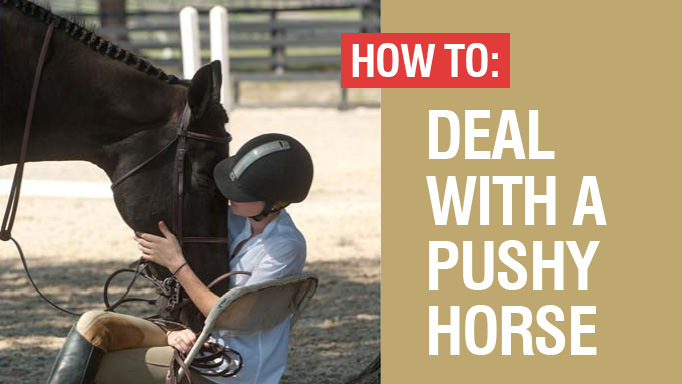 You can work on each of the three pushy problems with some of these tips: • Your horse cannot feel safe about you being his leader until he knows you can first protect yourself. Have clear boundaries with your personal space; start with an arm’s length of space around you as yours and yours only. 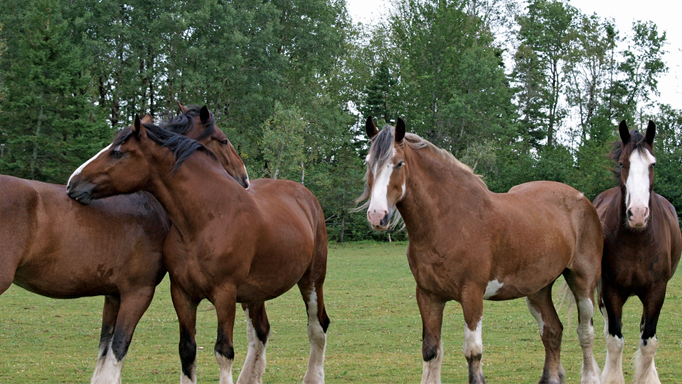 Do not let the horse into your space – if the horse comes forward, then wiggle your rope and get the horse to back up, or use your arm extension stick (a dressage whip works well, or you can purchase a special training stick from tack shops and natural horsemanship websites) to push the horse backward. •When you do want to rub your horse or have him close to you, make sure you ‘let your guard down’ by relaxing your posture and calling your horse in toward you. It should be very clear by your body language when it is okay to come into your space – and when it is not. Alternately, you can be the one to approach your horse. Your horse should not just walk up to you and start rubbing you – it shows you are a weak leader. Make sure if your horse is rubbing you, it is because there was an invitation by you! •Keep your focus. For example, if you are talking with someone or working in the field and the horse approaches you and starts being pushy, don’t stop what you are doing! If you turn around to back the horse up, then you create a game of ‘now I can move your feet,’ because the horse will learn that first they came into your space and made you move your feet (as you turn around to back the horse up). Instead, keep focused on what you are doing and wave your arms or swing your lead rope side-to-side to make the space around you uncomfortable. If your horse gets in the way of your arms or your rope swinging, then he may get bumped. While the intent is not to go after the horse, you want to show the horse that disrespecting your space is uncomfortable, because the waving arms/swinging rope could bump him. •To help establish trust, communication, and leadership skills, practice moving your horse around on the ground. Most people can move a horse backwards, forwards, and a step sideways to move over in the aisle, but also practice haunch turns and forehand turns. Being able to move your horse’s feet will keep your horse engaged, but also it will show the horse that you are the leader. •Stop feeding your horse treats by hand! Instead, feed treats on the ground or in a bucket. You can even do a scavenger hunt with your horse: Place treats around the field or paddock and then take your horse searching for the treats. This will stop the horse from pushing on you for treats, make him curious, and make play more fun. •Have confidence in yourself. Sometimes a horse will try again and again to crowd your space – especially if you have let him crowd you a lot in the past. Have confidence in yourself to keep making the space around you uncomfortable and keeping the horse out of your space. Be patiently persistent as you remind your horse about your personal space. Don’t get mad, upset, or too rough with a horse that is lacking confidence. 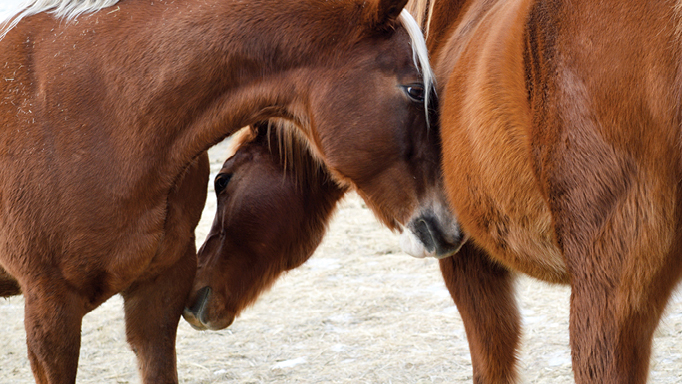 However, set very clear boundaries in order for your horse to feel safe. Remember to start with your ideal cue (whether that is a raised hand or stick, squared shoulders, etc.) and add pressure until the horse backs out of your space. Be very careful with your personal space and use an arm extension stick. Be prepared to use high levels of pressure in the event the horse challenges you. If your horse is so pushy you are scared of him, get help from an experienced adult immediately. Be really consistent with your new personal space rules. Allowing your horse to be pushy at all will confuse the horse and make them think it is okay to continue with the bad behaviour. 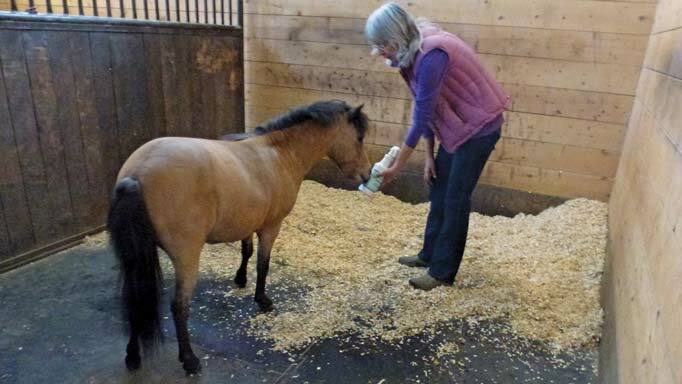 And no treats by hand – they are only for horses that are not pushy; otherwise, you are just encouraging the behaviour. Teach your horse to actually enjoy having fly spray applied, one small step at a time. You have been transferred to solitary confinement. You do not know why.